FREE SHIPPING. 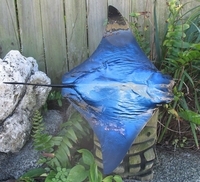 20" Blue Ray Half Mount Fish Replica Taxidermy. This is a very interesting piece. These rays can be painted any color and can really spice up a space. They look great in pairs or with a larger ray of the same color. Estimated time for shipping is about 2-3 weeks.